The Blue Jackets were in a period of transition. Times were changing, they said, and they were changing drastically. A few months earlier, they had begun the process of trading then-captain Rick Nash, paving the way for speculation, rumors and yes, more speculation about his future. You know how that ended. Prior to that, they had made a deal with the Los Angeles Kings and brought in an eager, ambitious defenseman named Jack Johnson. At the draft, the Blue Jackets traded draft picks to get a goaltender named Sergei Bobrovsky – but they were far from finished in their summer makeover. Scott Howson, then-GM of the Blue Jackets, hung up the phone on the morning of Canada Day after completing a deal with Ottawa Senators GM Bryan Murray, one that sent defenseman Marc Methot (an Ottawa native) back home and brought a versatile and under-utilized forward to Columbus. 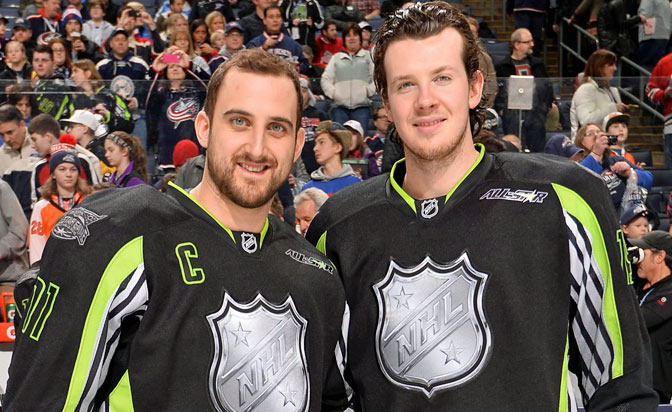 Nick Foligno, coming off a career-best season of 47 points, was another piece to Howson’s puzzle as he planned to swiftly move the Blue Jackets into a new era, one that did not include their former captain and most identifiable player. “Where (Foligno) fits will be up to him, but certainly we see him really contributing. He’ll increase our competitive level,” Howson said at the time. 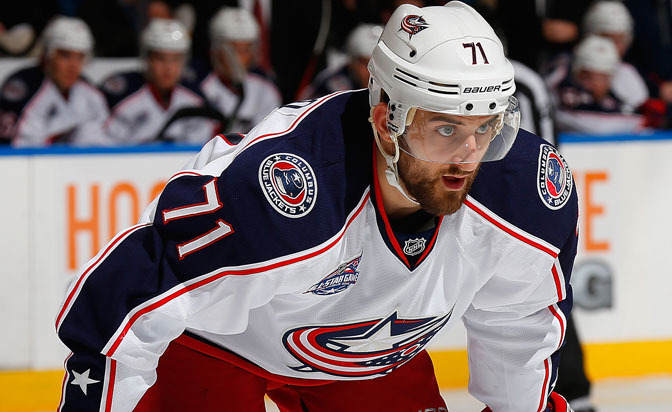 READ: How Foligno Earned The "C"
Foligno was far from the flashiest player brought in that summer, but in a way, that’s a testament to the type of player he is: one that keeps giving his team more. He scored a goal in his first game with the Blue Jackets: it was a waist-high redirection against the Nashville Predators, a nifty one at that, and Columbus went on to win that game and miss the playoffs by a thread in the lockout-shortened 2012-13 campaign. The Blue Jackets, as a team and an organization, learned a lot about themselves during that season. They learned that, above all else, there were brighter days ahead and their newly-assembled core of players had what they were looking for and could start to change the culture, elevating the franchise to a new level in the wake of trading its longest-tenured star. Now, approaching three years since he arrived in Columbus, Foligno and the Blue Jackets again embark on a new chapter – this time, with a letter sewn on the sweater that hasn’t been worn since Nash departed. Foligno and his wife, Janelle, have started their family in Columbus and established roots in a place that welcomed them right from the start. Foligno committed long-term with a six-year contract extension that was, by all accounts, consummated smoothly and announced on New Year’s Eve. “The team wanted to see that I was all in, I guess you could say, not just to the guys in the room but to the organization and the city of Columbus,” Foligno told BlueJackets.com. “With getting that deal done so smoothly and solidifying myself here long term, I started to think more about my role and what I wanted to be. I told management that, in signing this deal, I was committed to becoming a leader and a player who could be counted on, and I really hoped they saw that in me. When they told me that they did, it naturally progressed from there. I took on more of a leadership role, my game started to get better, and like I said, it just felt natural. There’s plenty of room to grow, no doubt. The Blue Jackets were one of the NHL’s youngest teams over the past three seasons, and since John Davidson and Jarmo Kekalainen took over hockey operations in that lockout year, their philosophy has been to keep the big picture in mind while not sacrificing the future for short-term gain. They have stockpiled draft picks, they’ve added several high-end young forwards in the draft and made trades from positions of strength in order to augment areas of weakness. Nick Foligno was one of the first players brought in during the Blue Jackets' roster overhaul in the summer of 2012. Yes, three years have passed since the Blue Jackets last had a captain. Has it been ideal? Not in the least, if you ask Kekalainen, who has had to answer the ‘captain question’ so often that it’s almost as if he gets paid by the response. But their mantra has been consistent: when the right person arises and stands out from the group, they’ll make the move. They had their eye on Foligno, 27, for some time as they looked for the player who would become the sixth captain in franchise history, following names like Lyle Odelein, Ray Whitney, Luke Richardson, Adam Foote and, most recently, Nash. But they knew that, in keeping with their decision-making process across the hockey operation, they could not and would not rush into it. Of course, the captaincy has often become a pressing issue (in the public eye) when the on-ice operation isn’t going well, and when the team is winning, the topic takes a back seat. Kekalainen accepts that as the reality of the situation, but he readily acknowledges that as the 2014-15 season grew older, the identity of their next captain came into sharper focus. Whether it was mid-April 2015 or early December 2016, they wanted a thorough process and one that resulted in one specific player making this a consensus decision. On May 20, 2015, they made it officially official. “I think it has a lot to do with us getting to know our players thoroughly over the last few years since JD and I got here,” Kekalainen told BlueJackets.com. “Most of all, why it’s taken so long is that we wanted to get it right. We’ve said all along – too many times, probably – that the right person is going to rise up from the group and become the obvious choice, and that’s where we are. Not only with the on-ice performance, but the off-ice stuff has been very impressive too, in the locker room and in the community. Nick says the right things, he does the right things, so he’s walked the walk. “We've always wanted to have a captain, but I never saw it as a problem that we didn’t have a captain; I wanted to make sure we did all of our homework and our due diligence and let the growth take place, and that was going to help us arrive at the right decision." Kekalainen won’t look back and say which players were candidates in the Blue Jackets Captain Derby (that’s a fictional thing, by the way), but he will say that Foligno made the strongest and most obvious case over the past two seasons. 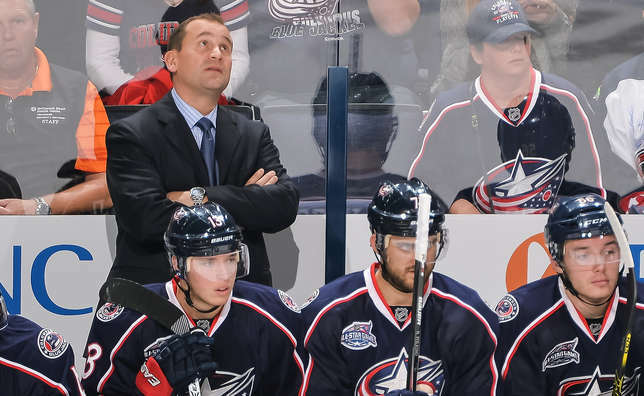 The Blue Jackets, under now fourth-year coach Todd Richards, have subscribed to “leadership by committee” with a core group of leaders, many who were in the mix to become captain before Foligno ran away with it. How exactly one ‘runs away with it’ is a complex, multi-part process that Kekalainen and management outlined some time ago. They watched closely, agonized over it at times, but maintained their “only when the time is right” approach from start to finish. For Foligno, things seemed to keep falling into place. He started the season on a torrid scoring pace, and when the injuries start to roll in hot and heavy, he displayed his versatility by playing all three forward positions – including a stint at center – while becoming one of the constants on a team that had about as much consistency in its lineup as a bowl of tapioca pudding. His All-Star nomination was the first of his career and he was named captain of the home team for a celebration of the sport hosted by the city he’s grown quite fond of. On top of that, he had a new contract in place that seemed to catalyze the captain conversations both with management and among management. “When we did the deal, we were getting fairly close to this decision,” Kekalainen said. “I had a conversation with Nick at the time, just before he signed, about taking on a bigger leadership role and growing into a leader, and what it takes to be a leader and a captain. We had that in mind, absolutely, and we discussed it with Nick in detail. There are so many different things that you have to take into consideration: the contract situation is one of them, because you don’t want to end up in a situation where you name a captain and the next year, you have to go find another one. Foligno was an All-Star for the first time in 2015 and named captain of the home team. Kekalainen had a working checklist of sorts, a list that included qualities and values he felt were imperative to being a successful leader. Foligno kept marking items off the list and providing moments for Kekalainen to turn to either Davidson or assistant GM Bill Zito and make mention of something said, conveyed or done, which is exactly what they were hoping for. And though the captaincy wasn’t something Foligno thought much of during the season, it was brought up again during their exit meetings on April 12 and 13, and things progressed quickly from there. Foligno missed the first two games of the Blue Jackets’ opening-round playoff series against the Pittsburgh Penguins with a knee injury, so he watched from above as Matt Calvert buried the (double) overtime winner in Game 2. He was getting closer but not quite ready to play that night, but so what? The Jackets had just evened the series at 1-1 before heading back to Columbus, a city that was pulsing at the thought of playoff hockey for the first time in five years. Game 3 was a low point, blowing a 3-1 third period lead and facing a pivotal Game 4 as the Penguins started to warm to the task. The Blue Jackets fell behind 3-0, rallied to tie it with 22.5 seconds left in regulation on a Brandon Dubinsky goal, and Foligno (still not at 100 percent) buried the game-winner from just inside the blue line, a goal that will remain forever etched into the minds of those who witnessed it. That moment, on the contrary, was a high point and it felt as though the Blue Jackets were poised to forge ahead and pull off what would have been a significant upset – but they lost the next two games and bowed out in six. After an exciting season in which Foligno gained a lot of confidence, took on more responsibility, earned the coaches’ trust and scored some huge playoff goals (down 4-0 in Game 6, he scored a goal that made it 4-3 with five minutes left), he went into his exit meetings with coach Todd Richards and management in a comfortable frame of mind. On the other side of the table, Richards and management wanted to – very politely – remind Foligno that getting comfortable wasn’t a good idea. They wanted more. In fact, they wanted a lot more, and they felt he had it in his inventory. “Sometimes, as a player, you feel like you’re doing everything you can, but then you take a step back and it clicks, and you understand what they mean,” Foligno said. “It was a good, open, honest conversation. They told me it’s about the consistency in my game, doing the little things right and focusing on the details, and understanding what makes me successful. When I came into this season, I was just trying to show them that I can be the player they believed I could be and that I believed I could be. I knew that, if I did those things, I could help the team and that was my No. 1 goal. It wasn’t the captaincy or anything else, really, it was just about our team. Foligno and Richards have built a good relationship in three years working together, one that makes such conversations easier and one that has established a mutual trust between them. On many occasions, Richards has implored Foligno to keep pushing himself and strive to get his game to another level, and Foligno has heeded the advice. He has worked tirelessly during practice, after practice, in the video room and in the weight room to become an impact player, which is the type of player that Richards, Kekalainen and the Blue Jackets’ management staff believe he can be and told him he can be. When the Blue Jackets encountered choppy waters early in the season, it was a litmus test for everyone, but Richards noticed one person and one voice that rose above the obstacles. "There was a lot of adversity that we faced," Richards said. "And usually, leaders become really visible in times like that. Now is the right time (to name a captain), and a big part of that and reason behind that is Nick and how he's matured as a player and matured as a leader. He's ready for this next step, and he's going to be a real important part of our team and real important part of our organization going forward." Was it a little difficult to hear that what he accomplished in 2013-14 wasn’t good enough? Perhaps, but disappointment didn't linger because Foligno had the bigger picture and bigger goals in mind, and he worked closely with Richards to make it all happen. Foligno said he was sparked by coach Todd Richards' belief that he could be an elite NHL player. “Once you get in the league, you’re obviously a very good player, and tweaking the details becomes so important to help you take a leap forward and become a better player,” Foligno said. “Richie was so good at pinpointing where I was going wrong, or what exactly I needed to change or adjust to get the most out of my game. He’s got such a good pulse on that. Dan Hinote, Craig Hartsburg and now Brad Larsen have been great resources and teachers for me, too. There was definitely a spark, and it was evident right away. A career year of 31 goals this past season thrust Foligno into the spotlight not only in Columbus, but also, around the NHL. He was center stage during All-Star Weekend along with teammate, close friend and frequent line mate Ryan Johansen, who saw a tremendous ambassador to the city and the franchise when the lights were the brightest. Any player who has aspirations of being a leader or, perhaps, one day becoming a captain has several qualities that can’t be taught. Among them: astuteness, or an awareness, of what’s going on around them and not being afraid to tap into the resources available to them. Foligno was a first-round pick of the Senators and he came into the NHL with high expectations, as his high skill level was apparent and scouts believed he had a wealth of untapped potential. In a sport and an industry where change is inevitable and unavoidable, the Senators had a mainstay wearing the C, and his name was Daniel Alfredsson. “Alfie,” now retired after an illustrious NHL career spanning 18 seasons and 1,246 regular season games while serving as Ottawa’s captain for 13 seasons, is one of the game’s great gentlemen and ambassadors. He was also a heck of a player, scoring 426 goals, 1,108 points and playing a key role in the Senators’ run to the 2007 Stanley Cup Final – but at the top of the list, he was “the guy” in the dressing room and an impeccable mentor for players coming up through the system. If you were playing for the Senators and you didn’t know who to look to, that was your own problem. If you couldn’t find someone to model yourself after, you weren’t paying attention. It was always Alfredsson and he was always available, and during five seasons spent in Ottawa, Foligno made sure to put his “student” hat on and constantly take notes thinking that, one day, he could be in the same situation. Over the past few seasons, the players in the Blue Jackets dressing room have (at least publicly) dismissed the notion of being captain-less as a distraction. By and large, what they were doing and how they were doing it was working and the captaincy chatter took a back seat to them trying to achieve what they’d set out to do, which was the same as the other 29 teams: make the playoffs and compete for a Stanley Cup. But as time ticked and personalities emerged, the Blue Jackets’ leadership group became more vocal in their desire to name a full-time captain. It wasn’t necessarily campaigning and self-promotion by the leaders nor was it born from pent-up frustration; they were simply speaking their minds and sharing what they’d already shared with management – that they felt, and strongly so, it was time to dust off the “C” and name a captain. “We have a group of genuinely good people here,” Foligno said. “That’s what makes it easy for us to be such a tight-knit team…we have a room full of great people and great leaders, and for a while, it was working when we were doing it by committee. Sometimes, through the course of a season, you need that voice to come through and speak to the group. After three years together, the Blue Jackets are quite confident in what they’re getting from Nick Foligno the hockey player. They have witnessed his evolution from a versatile, secondary contributor to a top-line guy who can deliver when they need him to. And let’s not get it confused: on-ice success is the ultimate business driver and needle-mover in the NHL. It’s what gets players paid, and in turn, provides security for their families and hopefully sets them up for a comfortable life – but for this role and this opportunity, there’s another layer and another set of responsibilities that’s both front-facing and important. Those responsibilities and traits have come easily for Foligno, who along with wife, Janelle, has developed a palpable affection for Columbus. He can vividly recall his first week here in the summer of 2012, doing the standard tour of morning radio shows and spending time looking at neighborhoods and homes, and experiencing the Midwestern charm when people greeted him at each stop while briefly stopping to say “hello” and “welcome to town” (that’s what people do here). Foligno and wife, Janelle, welcomed Milana in 2013. When their first child was born – baby daughter Milana, in the fall of 2013 – the Foligno family’s joy was quickly overcome by fear and uncertainty. Milana was born with a heart defect that eventually led to a rare surgical procedure in Boston which saved her life, but there were emotionally draining days for Nick and Janelle as they waited for the next steps. Nick had to miss games early in the season, at one point fleeing Detroit on a game day to get back home and be with Janelle and Milana as they discussed their options for surgery. They now have a beautiful, lively toddler on their hands – and those hands are quite full, mind you. They now have a home in Upper Arlington, and those roots are taking a stronger hold. But the outpouring of support from teammates, their families, the Blue Jackets organization and the people of Columbus only strengthened the bond between the Folignos and the community. Because of that, they feel an indescribable connection. As the Blue Jackets begin a new chapter, they have a captain motivated by both failure and success, inspired by his family’s courage in the face of adversity, and excited about the future for a team that only seems to be scratching the surface. “It has been such a great, warm, positive relationship between us and the city,” Foligno said. “We fell in love. My wife and I both feel that way. I really enjoy saying that I live in Columbus and that Columbus is our home. I feel really good when I say that. I love the people, I love the town, I love everything. When you get that in your life, it’s awesome. We have a family now, and you look around our team, so many of my teammates have kids and they’re raising their families here, too – it’s not a coincidence. When I talked to people about Columbus three years ago, they told me all of these things and now that I’ve seen it first-hand, it solidifies what an awesome place this is. This is a special place for us, and I want to be here for a long time and have success here, I truly do. This is the place we want to be, and we’re so proud to be part of Columbus and play for Columbus.